Happy New Year and Happy New Backyard! It’s summer, and that means it’s time to spend time outside. Here are a few summer projects to keep you outside and enjoying the sun over the holiday period. This is the perfect time of year for outdoor dining. We’re only one month into summer, so that’s two more in which to enjoy your new patio! There are a few good material options to tile your patio in, depending on what colour and style you’re looking for. 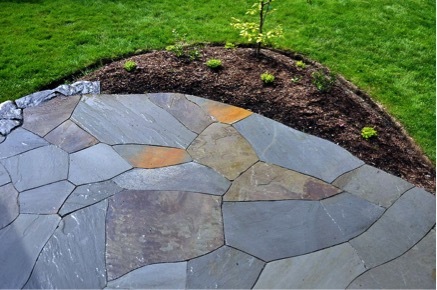 Bluestone is a great choice if you want to have some fun with the styling of your patio. This type of stone is easy to cut and shape if you need tiles fitted to a specific space, and (even though the name is a little misleading) bluestone is actually available in a variety of colours. Bluestone comes in shades of blue, grey and beige, so you can pick something that perfectly matches your home. Take a look at the image below for some inspiration; these bluestone tiles have been cleverly cut and fitted together to create a unique and stylish effect. Granite is another great material for patios. It’s a very durable product, and, just like bluestone, is naturally slip-resistant. Limestone is another good choice; its natural, earthy tones make it ideal for a patio bordering your backyard and blending with the aesthetic of your garden. It’s a great feeling to start the New Year with a fresh garden. Paving can add good structure to your garden, while tiling can help form boundaries for new garden beds, or keep your ground cover plants neatly separated from your lawn. Your young plants will be glad to have a new garden bed ready for them by autumn – autumn is a great time of year to avoid Australia’s intense summer heat, and sometimes frigid winter. Sowing seeds for flowers in autumn will ensure you have some beautiful blooming plants in spring, and autumn is also ideal to get winter veggies planted. 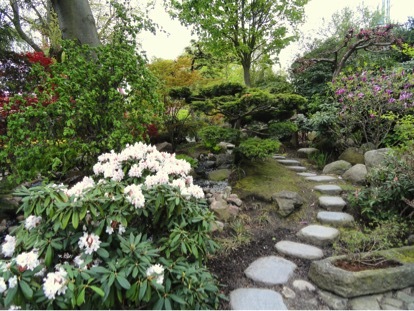 If you’re redesigning a new garden, or you’ve already got a smashing one to show off, making a garden path is a great way to encourage people to explore it. Travertine is a really attractive option for outdoor paths. 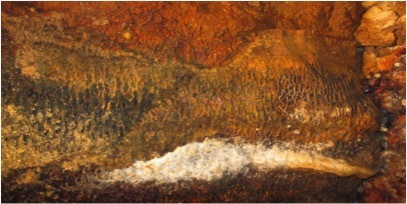 The stone has naturally occurring iron, and, depending on the amount of the mineral present, the stone can appear as anything from reddish brown to golden. Another option is sandstone. A very classic choice, sandstone is renowned for its strength and durability. Again, sandstone comes in many shades of red, blue, pink, and light green. There will be something here to suit your styling and project. If well maintained, sandstone fares really well outside. If you’re looking at completing an outdoor project this year, talk to the team at Australian Slate & Stone to get their expert opinion on the best materials for your outdoor project.